Are the Extracellular Pathways a Conduit for the Delivery of Therapeutics to the Brain? 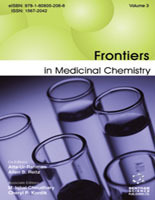 Frontiers in Medicinal Chemistry, Vol. 3 continues the tradition of the two previous volumes in providing a comprehensive selection of manuscripts involving diverse therapeutic areas as well as a section on important enabling technologies. Although the topics covered were selected from the Bentham journals "Current Medicinal Chemistry", "Current Topics in Medicinal Chemistry" and "Current Pharmaceutical Design", each of the authors has had the opportunity to update their original contributions with additional information or commentary, and many have chosen to do so. Therefore, there is a substantial amount of new material in these reviews that has not been published previously. This volume contains 26 chapters arranged in eight sections. The first section covers the area of Infectious Diseases with manuscripts on HIV-1 integrase and drug resistance mediated by HIV-1 reverse transcriptase and HIV protease inhibitors. The next section is on Cardiovascular Diseases which addresses ethnicity in heart failure management and hypertension, gene therapy, novel antihypertensive agents, combined Class IB and Class III antiarrhythmics, and the adenosine A1 receptor. The section on Central Nervous System Disorders then starts with a review on extracellular transport into the CNS which is a nontraditional approach to the delivery of useful therapeutics across the blood brain barrier. This is followed by articles that review neuroprotective agents, the nicotinic acetylcholine receptor and Alzheimer's disease. The Endocrine and Metabolic Disorders section highlights melanocortin receptors and protein tyrosine phosphatase 1B inhibitors for diabetes and obesity. The Immunology section addresses autoimmune disease and transcription regulators. In the Oncology section are found manuscripts on FLT3 tyrosine kinase inhibitors, Ca2+ channel blockade, and chemokine receptors. The Enabling Technologies section is the longest one with seven manuscripts, reflecting the importance of new approaches to conduct modern drug discovery and medicinal chemistry research. The topics covered include bioinformatics, chemical genomics, trends in hit-to-lead work, virtual screening, and computational approaches to pharmacophore identification, protein-protein and protein-drug interactions, and cytochrome P450s. Finally, the biology of the heme protein in health and disease is reviewed as well. We thank the authors, who contributed to this volume, and congratulate them for the high quality of their work. We also thank Bentham for sponsoring this book series. We expect that Frontiers in Medicinal Chemistry will continue to be published on an annual basis with timely and helpful reviews in areas of keen interest to practicing medicinal chemists throughout the world. H-1031 Budapest, Záhony u 7. Basic Research Program, SAIC-Frederick, Inc.